What's a composite image ? What's a mosaic image ? A composite image is an image created by multiple images placed together to form a single, combined picture. A mosaic image is a big (composite) image made by combining smaller images. The land and coastal ocean portions of the global images in this seasonal animation are based on surface observations collected each month in 2004. Each monthly mosaic image was made by selecting only the cloud-free parts of the single day images. This process was performed by a computer which automatically recognizes and removes cloud-contaminated data. These monthly images are not realistic scenes, since we always have some clouds, but it allows to have a clear view of the Earth's surface by month. Look at this image. 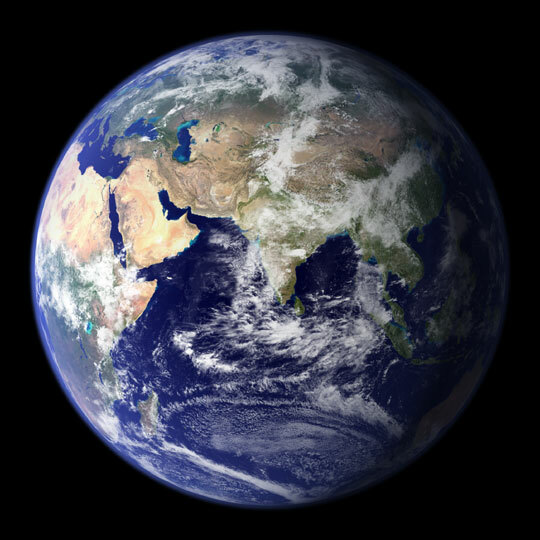 It is an artificial view of Earth because it is made of thousands of small overlapping individual images. These single images were combined to obtain a giant mosaic, a continuous picture of a vast portion of the Earth surface. The NASA Blue Marble collection hosts series of mosaic of satellite data. The Blue Marble. Source: NASA.